The night started with a relaxed atmosphere waiting for the first support act of the evening, Grace Petrie. A small girl and her guitar filling the entire room with a classic folk vibe. She quickly engaged with the audience fulfilling her role in warming up the crowd. For an artist that is relatively unknown she had interacted with the crowd just as Frank himself would. Grace finished off her opening set with her incredibly heartfelt song for her Girlfriend, ‘Northbound’. The main support were the incredible American Emo/Pop Punk band Jimmy Eat World. From such a vast array of over 100 songs the band perfectly picked out the ones they knew would receive a buzzing reception. Every song had people singing their hearts out, reminiscing about their younger days when Jimmy Eat World first came on the scene. The band have a remarkable talent for pairing the most heartbreaking of lyrics with pop punk riffs. Their entire set was flawless, however you could tell lead singer Jim Adkins wanted to take the stage and start performing like a true rockstar but didn’t want to upstage Frank himself or tire out the crowd. Jimmy Eat World ended with undoubtably their most iconic song ‘The Middle’. A song that had the entire audience from the oldest person to the youngest, recognising they could dance freely; this created a great sense of unity just in time for Frank. In the words of Frank Turner himself ‘Now I’ll play and you sing, the perfect way for the evening to begin.’ And indeed it was. Opening with his energetic song ‘Out of Breath’ Frank ironically left most of the the crowd out of breath after initiating a large ‘circle pit’ in the centre of the audience. Frank then showed his comedic side by thanking Jimmy Eat world and how he loves giving ‘new fresh bands like them a chance to shine’. Then it was straight back into some classic Frank songs to get the crowd singing. 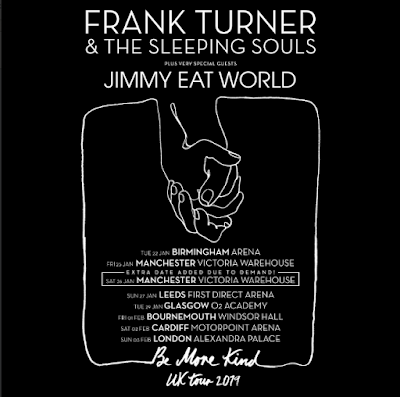 Personally it was great to see Frank play ‘Plain Sailing Weather’ for the first time on his ‘Be More Kind Tour.’ A song that is loved by many but not played too often, definitely created a true Punk Rock atmosphere amongst the crowd. 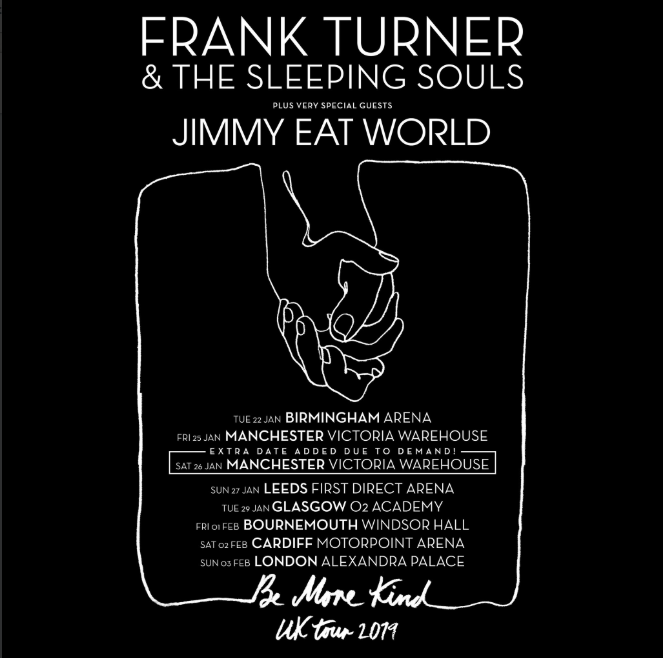 What followed was Frank playing through many of the songs off his latest album ‘Be More Kind.’ A definite highlight of these songs was ‘Little changes’ as the music video was played on the drop screen and the audience united as one to copy the dance moves from the video. For the final half of the set Frank took it down a notch at first. Playing three acoustic versions of songs from a variety of albums. It is nice to see an artist change up their set from gig to gig as at this point there have been a different three songs for each show so far on the tour. Frank then welcomed back the ‘Sleeping Souls’ to aid him in the final few songs before the encore. Before this he ‘ended’ with ‘Try this at home’ and ‘I still believe’, songs that perfectly shows off Franks punk rock style and creative lyric writing skills. For the encore, Frank played 4 of his most famous songs. The crowd responded with a powerful and lively vibe that consisted of moshing, singing and dancing. In particular Frank ended with ‘Four Simple Words’ and excited the audience even more than he already had by joining them. He called for another ‘Circle pit’ and then proceeded to jump in the middle of it and slow dance with one of the women from the crowd. It ended with the extensive use of pyrotechnics and a classic cloud of confetti with the sound of cheering fans as Frank soaked up the well deserved applause before leaving the stage.